Suttons is an internationally renowned supplier of flower and vegetable seeds, young plants, bulbs, fruit bushes and other horticultural products to amateur gardeners. We have a reputation for quality and service that is second to none, and a remarkable history that goes back over two hundred years. The company was founded in 1806 by John Sutton (1777-1863) who named it the 'House of Sutton' of King Street , Reading, supplying corn. In 1832 he was joined by his sons, Martin Hope (1815-1901) and Alfred. A few years later in 1837 the business was transferred to the Market Place, when they induced their father to launch out into the flower and vegetable seed trade. From this time on the firm progressed and expanded rapidly, being the first seed house to supply pure, unadulterated seed. By untiring energy and business acumen they laid the foundations of the great firm as it is today. The determination to supply only the best seed has been carried on by their successors, and through the years the name of 'Sutton' has become known the world over. The Market Place shop was double-fronted with large windows each side of the entrance. It was in a prominent position and overlooked the Saturday vegetable and general market. Martin Hope acquired nursery grounds in Queens Road along with a greenhouse. By mid-1838 he began selling greenhouse plants, many of the bulbs coming from local nurseries, but some from Holland. In 1836 Martin Hope, aged 21 years, became a partner and the 'House of Sutton' became Sutton & Son. Suttons received Royal patronage in 1858, when Queen Victoria requested Martin Hope Sutton to supply seeds to the Royal household; the honour of the Royal Warrant has been bestowed on the firm ever since - right up to the present day with Her Majesty the Queen. In 1840 the decision was taken to establish a laboratory so they could test the seed themselves for germination and purity - a practice which became law 80 years later with the passing of the Seeds Act, 1920. Sutton's seed-testing station was one of the first to be licensed by the Government. We still have our own seed testing laboratory along with trial grounds. Our varieties continue to be tested to ensure high germination, quality and purity levels. Also in the year 1840, Martin Hope was at Reading Station to see the first train depart for London , taking advantage of selling flower seeds to spectators and passers-by. The railway from then on took an important part in bringing large consignments of seeds, bulbs, etc to Reading for Suttons and, on the other side, sending wholesale orders by rail which were too heavy to go by mail. As the years went by many changes took place - lorries replaced horse-drawn carriages; the garden tools available slowly improved; the use of fertilisers increased. And, of course, there have been significant advances in breeding and hybridising new strains of seeds, along with the introduction of many new varieties. The company expanded further, and, in 1873, new offices and warehouses replaced the original premises in Market Place , Reading. These premises had various offices - including Export, Ledger, Order, Invoice; separate store rooms for flower & vegetable seeds, bulbs, potatoes, grass and root seed, farm seed; along with recreation rooms, an exhibition department and even their own fire station which came with cottages for the firemen! There were even stables, where not only were the horses fed, groomed and bedded, but vans and trolleys washed. There was also residence for the head groom. Houses were built at the testing grounds, where plants were grown for the purpose of saving stocks of high-class seed for flower growing. 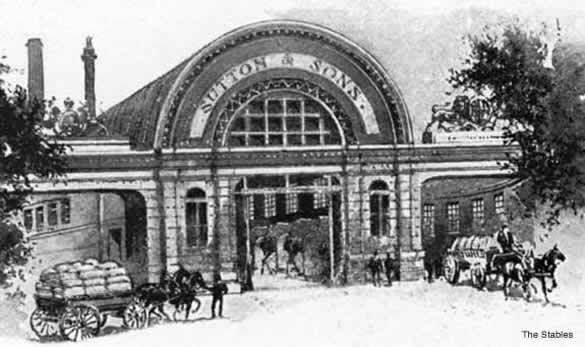 In 1962 Suttons moved again to new premises on the then main London-Bath (A4) road. The design and modern building had all the necessary features to run a successful business. At the time the premises were the most up-to-date of their kind in the country. Flower and vegetable seeds are produced for Suttons in many parts of the world. This is because of the need for long summers and guaranteed dry harvesting conditions, thus ensuring that the seeds are of the highest quality. In 1965 Suttons were the first company to offer foil packets to the amateur gardener in the UK, after developing the Harvest Fresh Foil seed packet system over many previous years. The company relocated to Torquay in Devon from Reading in 1976. In December 1998 Suttons moved to brand new premises in Paignton where all packaging and distribution is now carried out. If you'd like to find out more about the history of Suttons, then we recommend Suttons Seeds - The Definitive History book published by Reading University Press.